All Kooler Design Studios Patterns are Downloadable. A PDF of the pattern can be downloaded and printed immediately after purchase. NO Pattern will be shipped. 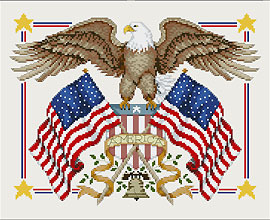 This eagle flies the flag in this ultimate patriotic design by Linda Gillum. An exclusive reissue of a long-unavailable design now available as a chart. The Chart Pack comes with chart, DMC Floss color numbers and general directions.